During the Han dynasty, every man was expected to serve China for at least one year at age twenty three. Although, a man’s adulthood began at twenty, the government wanted to allow the citizen three additional years to store away money so he could serve as a soldier without being paid. In a situation where a man twenty three years of age did not want to serve in the army, he could instead pay a certain amount of money, which was used to hiring willing soldiers for a longer time period. 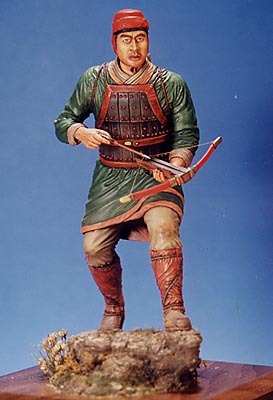 The ideal goal of the Han Dynasty was to have citizen soldiers, like in Rome. A citizen soldier would have been a regular citizen living his own life, but was expected to be loyal to his country if he need be called upon to serve as a soldier. Annually after the harvest, each man was responsible for serving one month of reserve military duty. This specific time was chosen so that each man could help his respective family with the harvest, instead of losing valuable labor if the man was not present. "Chinese Han Dynasty Soldier." Alpha Image Inc. Model Workshop.